I’m not a big fan of Windows, I particularly find the O/S weird and incomprehensible, while the desktop actually is quite nice. Throughout most of my career, I’ve been mastering all sorts of UNIX like O/S’s, although mostly as servers, so I am doing a lot of command line stuff. I grew up with “vi” in my fingers, and despite having tried, I never really got the hang of any other editor. So for the work I am paid for, it’s very little more than lots of terminal windows, shell commands, and all that jazz. But for the desktop, I’ve kept Windows, and I e.g. find that Microsoft Office does the job it is supposed to do very well. I tried switching to Linux several times, but despite it being a much nicer O/S, I never really got the hang of the desktop, and I never really got to like LibreOffice or its predecessors. Then one day (as it does happen), my PC running Windows just didn’t work well any more; it just fell apart – the O/S that is. Network would stop working, Windows Update never completed, and what do I know. So I decided to really take the step this time and find a good alternative. Ubuntu ships a nice O/S, but the GUI just doesn’t suit me. I think they try making it look as close to Windows as possible, but I never liked it. For a starter, how come it isn’t possible to move the panel off the top/bottom of the screen and to either side. Haven’t they seen that the physical displays gets wider and wider but don’t get taller? Those panels just take precious vertical space. Windows got that right! Also, Ubuntu is doing what they can to hide what I really like: the underlying O/S. I then found Xubuntu, which replaces the (in my view) awful Ubuntu gnome-ish GUI with XFCE. It has all I want out of the box. Multiple desktops. One panel with everything in the place I want it (on the left), flexible networking, and a nice GUI, plus it was quick to get an xterm button, which I just need so much. So it doesn’t try to hide the fact that it’s really running Linux. Take a look at the screen-shot, which is from the lower left part of my screen. 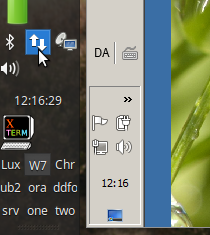 There are a number of desktops named “Lux”, “W7”, etc, icons for the most important things. If I click the network icon (where the mouse is), I see the wired and wifi networks, plus a few VPN’s, I also have; all nice and well integrated and without any of the extra, disturbing stuff you’d have on Windows. The symbol next to it (with the dish) brings up a few remote desktops, both to Windows (with RDS) and to Linux (with VNC). Again, all nice and well integrated. Now – you may ask – what is that to the right of the panel? Doesn’t that look like classic Windows? Sure enough; I am also running Windows. As I said, the Windows GUI isn’t too bad, and I really need Microsoft Office as my productivity tools. Not only because I don’t like LibreOffice, also because I do a lot in Publisher, for which no Linux alternative exists. So I run Windows in a VM (from virtualbox.org). I have a license to Windows 7 and Office 2010, and those two are all I need from Microsoft. Keeping that simple also means no need for lots of memory or disk, so it all runs nicely on my laptop with a mere 8G of RAM and some 500G of disk. Well, I should add I also have a NAS, where all the stuff I really do is stored and backed up. So when the hard disk crashes on my laptop, I need to install all software from scratch. I know that, and I accept the risk. What really makes this whole thing so nice is that it combines the best of both worlds. I understand Linux, and have no problem using the command line, and some background knowledge and experience really is needed to get to where I am. The Xubuntu software manager (really Gnome) doesn’t do everything, so you need to know what ‘apt-get’ or ‘dpkg’ is about. Some other configuration also requires you to have some prior knowledge, so the whole thing isn’t 100% plug-and-play. But I neither need it to nor want it to. I prefer to understand what’s going on and prefer to control things. I also run a small Oracle express database, and to get that properly configured also required existing knowledge.